Last Friday, I got a plane and flew to Buffalo, N.Y., to meet a group of women I met on the Internet. We’ve all been blogging together (at www.GardenRant.com) for over a year, but this was our first time to meet in person. I’m the only West Coast gardener in the group. One of us is in Washington, D.C., and the other two live in upstate New York. So we met in Buffalo, where one of us, a magazine editor named Elizabeth Licata, helps organize an annual event called GardenWalk Buffalo. Over 260 gardens would be open for the weekend, and thousands of people would be wandering up and down the street in her neighborhood. At night, we’d make the rounds of backyard cocktail parties -- the sorts of parties where people shout drunkenly about dividing their hostas and argue over whether it makes sense to mail-order a coleus. What’s not to like? We issued an open invitation to our readers, and we all flew in for a weekend of horticultural revelry. At this point, I need to make a confession. GardenWalk is based on a premise that, before last weekend, I never fully understood. The premise is that gardening can transform a neighborhood and revitalize a community. You’d think that I would be totally behind this concept, and I am, in the most general possible way. It’s one of those feel-good ideas that nobody is really opposed to. Kind of like gardening with kids. If you were to say to me (and, for some reason, people often do), “Oh, isn’t it wonderful to get children involved in gardening?” I would nod and give some vague, glassy-eyed response about the wonders of nature. But the truth is that I have no idea what children ought to be involved in, other than being quiet on airplanes and in restaurants, and it’s hard for me to imagine any particular activity that all children would enjoy anyway. But sure, why not? Kids and gardening. Go right ahead. So until I went to Buffalo, that’s how I felt about the transformative power of gardening in communities. Gardening is such a solitary experience for me --- that’s what I like about it -- that it’s hard for me to get excited about gardening in groups. And before I went to Buffalo, if you had asked me whether the problems in my neighborhood could be traced to a lack of gardening, I would have rolled my eyes and pointed to any number of other social ills that we need to address before we start planting petunias -- petty crime, trashy rentals and obnoxious substance abuse, to name a few. Now I’m not so sure. 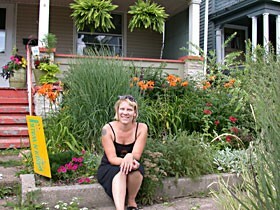 GardenWalk Buffalo started 17 years ago in one of Buffalo’s older, urban neighborhoods. A few people opened their gardens for the weekend, and the idea spread--along with the plants. More people in the neighborhood started to garden. Within a few years, they were participating in GardenWalk, too. The walk expanded into other neighborhoods, including what you might call “transitional” neighborhoods like mine, where long-time homeowners co-exist with renters, college students and rehab centers. And guess what? Things started to change. Neighbors got to know each other for the first time. Suburbanites were so impressed with what they saw that they started moving back into town. And somehow, as neighborhoods started to look better, they actually became better. Quieter. Safer. More friendly. More stable. I saw neighborhoods where this transformation was complete, and neighborhoods where it was only just getting under way. In every case, I was astonished at what a difference a few geraniums could make. I spent a couple years in college studying community planning, and I’ve been gardening for over a decade, but it took this trip to Buffalo to really make the connection. Even now, I still can’t explain exactly why this works, but I believe that it does. Now I walk around my neighborhood (I live in Eureka, in the area between Old Town and 14th Street) and I wonder what a difference gardens could make here. I can think of only a handful of great gardens within walking distance of my house -- and, of course, I’m talking about front yard gardens that I can actually see from the sidewalk -- and I wonder how life would change here if there were gardens on every block. And what if, once a year during the long, warm days of late summer, everyone opened their gardens for a free, non-competitive, non-juried garden walk? Even the drug treatment centers. Even the apartment complexes. The democratic spirit of a garden walk is so very Humboldt County: Anyone can participate, and your garden doesn’t have to be perfect. It just has to be open for the day. I’ve never wanted to put my garden on a garden tour -- and if you’ve seen my garden, you’re probably grateful for that -- but this is the kind of event I could really get behind. I’d love to live in a neighborhood where people garden and swap plants and throw open their gates once a year. Oh, and the post-garden walk cocktail parties? It just so happens that this summer I’m drinking a botanical variation on a gin and tonic that I’m calling a “Garden Party.” You can count on me to pour the drinks.